Buying your greeting card printing through A Local Printer allows you to create truly one-off cards that reflect your own style and personality. We don’t offer a ‘select-an-image’ option with our card printing – what you decide to print is all down to you and your own unique designs. Our cards are printed on superior papers using the latest digital print technology for a vibrant product that will enhance your designs. We are always seeking to add new products to our greeting card range, whether it is size or papers, and we think we have got a pretty good selection here! We hope you enjoy browsing through them for the perfect product. With our ‘five for one’ multiple sorts deal you can easily create packs of cards for retail or for your own personal use, be it invitations, thank-you cards, design portfolio cards or announcements. A sight for bored eyes - a range of litho printed neon greeting cards designed to blow the cobwebs away. Rev up with Hot Pink, Bright Orange or Lime Green in a choice of four sizes and four materials - Recycled, Silk and textured Conqueror Stonemarque and Nettuno Blanco. Your very own range of Greetings Cards – Cards to say ‘Hi’, ‘Bye’ , ‘Welcome to the World’, ‘Thanks’, ‘Sorry’, 'Seasons Greetings' and most importantly, cards sent with Love. Our greeting card printing services allow you to say this and much more in the most unique way – with your very own images and message. Order up to five cards for the same published price; our way of sharing the love with our customers. Choose from Recycled or Silk boards or our new luxury tactile Nettuno or Stonemarque. NEW! Greeting cards printed on this unique material benefit from something a little bit special due to the base colour of the card and the ‘inclusions’ of straw and recycled content. The result is a thick board with texture plus visual appeal and interest. Truly stunning. Keep Calm and Order Kraft Cards! These cards are the epitome of vintage style and look equally fabulous with simple or complex designs on this forgiving paper. 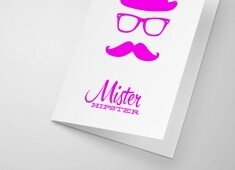 Choose from finished size A5, A6, DL or cute 120 x 120mm square with the option to order matching kraft envelopes too. Take advantage of our very useful multiple sorts option giving you the go-ahead to order up to 5 designs for the same price! As a new edition to our greeting card printing we are pleased to introduce our Luxury Range with a choice of four very special boards that deliver a pleasing visual and tactile experience. Available in standard A5 and A6 sizes and from 1000 up, these cards are eco printed with vegetable oil based inks. 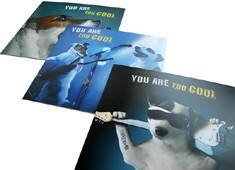 The quality of the finished product makes these cards an ideal addition to any retail range. 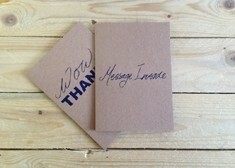 Order proofs of your Greeting Cards before you place larger volume orders. We will digitally print your artwork to the correct size and on the correct material so that you can see exactly how your job will look and feel. 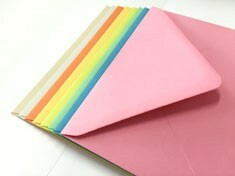 Add a splash of dash to your greetings cards with these vintage-style classic coloured envelopes. High quality 100gsm with a gummed diamond flap in a range of fabulous colours. Let's cut out the blah blah - for an 'in a nutshell' overview we have a separate page about why you should buy your greeting cards from us. All of our cards are supplied with either C5 or C6 FREE WHITE envelopes with a gummed diamond flap. 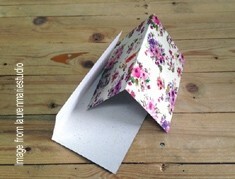 Or you can order from our range of beautiful vintage coloured C6 envelopes for extra helpings of gorgeous. Our square cards are supplied with FREE white gummed flap envelopes, size 130 x 130mm. We really enjoy being a greeting card printer! Whether it is a birthday card, congratulations, sympathy, wedding or new baby it is always well received – it demonstrates that you are in someone’s thoughts and is a personal touch in a world going digital. Receiving a personalised card is even better – it means that the sender went the extra distance to make sure their card would have real meaning. 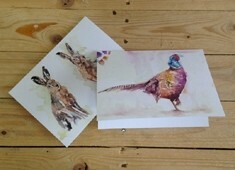 If you are in the market for some card printing why not have the matching set? We also print custom wrapping paper and gift tags. Need some guidance in to the design of your card? Not a problem. We have a team of designers on site who will be happy to help with anything from an artwork tweak to a full design service. You can print up to 5 designs for the prices shown on the website*. If you have more designs that you would like printed please use the multiple sorts selection in 'Build Your Order' on the product page. When ordering multiple sorts we prefer that it is an equal number per sort to print, ie 5 versions of 50. However, we also know that some of our customers really need an unequal quantity per sort and for them there is the 'Unequal Split' option. We have a new minimum quantity per sort of 10. * The five sorts offer does not apply to Luxury Greeting Cards, instead we offer 2 sorts of A5 or 4 sorts of A6. 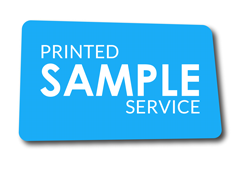 If you have concerns about the print quality we recommend using our sample service to order proofs of your printed cards before you place larger volume orders. We will digitally print your artwork to the correct size and on the correct material so that you can see exactly how your job will look and feel. Don't just take our work for it!